The Jacksonville Jaguars joined the National Football League (NFL) in 1995 as an expansion team, along with the Carolina Panthers. Their first selection in the NFL draft as a team was Tony Boselli, an offensive tackle from the University of Southern California (USC). The team's most recent first round selection was Dante Fowler, Jr., a defensive end from the University of Florida. The Jaguars have never selected the number one overall pick in the draft, but they have selected the second overall pick three times. The team has selected four players in the first round from the University of Florida, two each from the University of Southern California and the University of Tennessee. ↑ Pulliam, Kent (1995-04-23). "No. 1: 322 pounds of potential, Chiefs trade down, then nab Michigan offensive lineman". The Kansas City Star. The McClatchy Company. p. C1. |access-date= requires |url= (help)The Jaguars traded their 31st overall pick and a third and fourth round selection to the Kansas City Chiefs in exchange for the Chiefs' 19th overall pick. ↑ The Jaguars traded quarterback Rob Johnson to the Buffalo Bills in exchange for the Bills' ninth overall pick. ↑ Andrew Mason (2006-04-28). "Broncos Keep the Focus Up Front With Three Linemen on Day 1". Denver Broncos. Retrieved 2007-10-15. Jacksonville traded their 17th overall pick to the Denver Broncos in exchange for the Broncos' 21st overall, third-round, and sixth-round picks. ↑ The Jaguars received the eighth overall pick from the Baltimore Ravens. ↑ Wesseling, Chris (2013-04-25). "Luke Joeckel to Jacksonville Jaguars in 2013 NFL Draft". National Football League. Retrieved 2013-04-25. Alder, James. "NFL Draft Basics:Determining Order of Selection". About.com. Retrieved 2007-10-15. 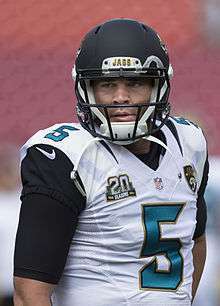 "databaseFootball.com–Jacksonville Jaguars". databaseFootball.com. Retrieved 2007-10-15. "NFL Draft History: First Round by Team: Jacksonville Jaguars". National Football League official Web site. Retrieved 2016-09-16. "Hall of Famers by Franchise". Pro Football Hall of Fame official Web site. Archived from the original on 2007-10-11. Retrieved 2007-10-15. "Jacksonville Jaguars (1995-Present)". Sports E-cyclopedia. Retrieved 2007-10-15.